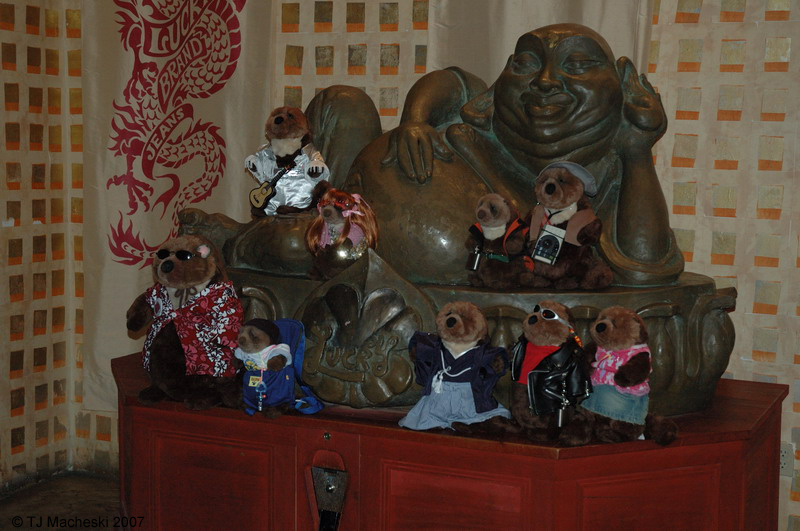 The Ottarz at Fred-Con made a pilgrimage to Rub de Buddha.… - Ramblings of Mad Shutterbug & the Border Collie Bros. The Ottarz at Fred-Con made a pilgrimage to Rub de Buddha. Group portraits of tourist crowds are obligatory, of course... Feel free to click through to Flickr (the photo is the link) for a Notes Roster of Who's Otterz Who. In other news, re-shaped the Adolescent Doeling pen today, providing them with some greenery as well as moving it a bit closer to the Holding Pen entry to the Goat Paddock. We will re-claim unused portions of the Adolescent Doeling pen to help re-configure the Buckling Pen into separate but equal (oh, bad Madshutterbug, bad) Buckling and Adolescent Doeling pens inside the Goat Paddock. Worked on that until it got quite too warm out, then retreated inside. Inside I worked on post-production preparation for the Participant Proofs Disks from the Summer Fae shoot. Only 100 images left to prep, oh my. Rather cross-eyed now so not going to work on those just yet. Should still be burning those disks by Sunday evening (Saturday is a Hospital Work Day, today is Off for that reason).